Your car sales contract will break down how tax is calculated. 1. 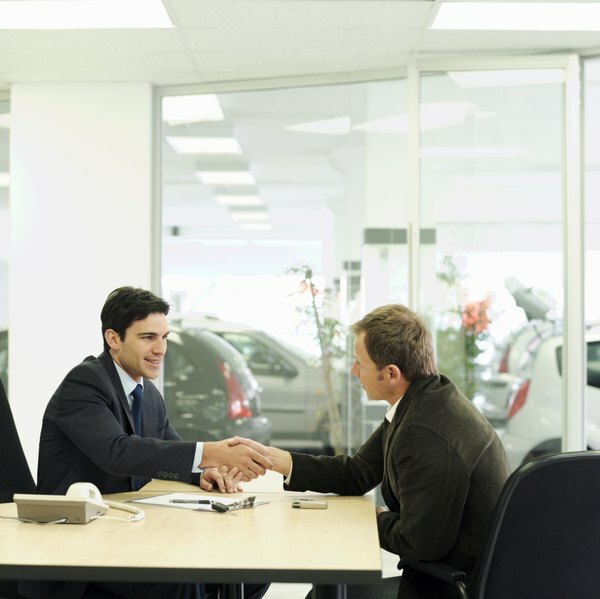 Does My Trade-in Get Deducted From the Sales Tax on a New Car in Arizona? 3. Do You Pay Sales Tax on Game Show Prizes? In 42 out of the 50 states, when you trade in a car to purchase a new one, you will get some sort of sales tax credit on the value of your trade. The amount of tax you pay depends on what you are buying, what your trade is worth and your state's sales tax policies. The dealer will calculate and collect the sales tax, but it does not hurt to check the dealer's numbers. Across most of the country, the sales tax you pay on a car purchase at the dealership will be the sales tax rate times the difference between the purchase price and trade-in allowance. The new car cost and trade value will come off the sales contract for the car deal. For example, if you are buying a new car for $25,000 and the dealer is giving you $10,000 for your trade, you will pay sales tax on the $15,000 difference. If sales tax in your state is 8 percent, the tax would be $1,200. Without the trade value sales tax on the purchase increases to $2,000. States handle the sales tax rate on car purchases differently from state to state. In some areas, the sales tax rate you pay is the rate in effect where the dealer is located. Other states require that the rate be based on your home address tax jurisdiction. The sales tax will be the same whether you pay cash or finance the purchase with a regular car loan. In most states you do not pay sales tax and do not get a tax credit on your trade-in if you lease the new car. Another way to view the sales tax reduction from trading a car -- and a favorite view of car dealers -- is that the reduced sales tax can be equated to a higher value for your trade-in. If the dealer gives you $10,000 for your trade and trading the car reduces your sales tax bill by $800, you are in effect receiving $10,800 for the car you are trading. If you sold the car on your own, you would not receive the sales tax savings, so would have to sell the car for more than $10,800 to come out ahead of going the trade-in route. The state of Oregon has no sales tax, so if you live in that state and buy a car, the tax calculation is easy -- zero. In seven other states, there is no credit or sales tax reduction when you trade in a car. Those states are California, Hawaii, Kentucky, Maryland, Michigan, Montana and Virginia. If you live in one of these states you calculate sales tax by multiplying the full new car purchase price times the local sales tax rate. Edmunds.com: What Fees Should You Pay? Can You Deduct Sales Tax on a Car for Taxes? What Factors Determine Who Pays Sales Tax?